To the casual passerby, the large yellow and white Georgian styled house at 2401 Kalorama Road, NW in the Sheridan-Kalorama neighborhood might be mistaken for a recreation or a slightly out of place house built in the 1930s when Colonial-styled architectural revivals were popular. 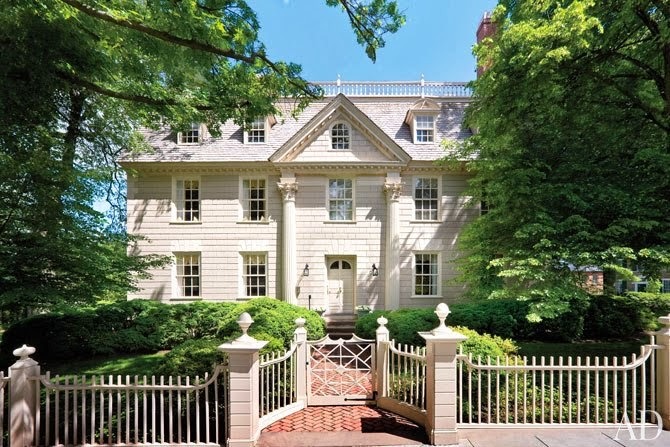 Its origin, however, dates from its initial construction in Danvers, Massachusetts in the middle of the 18th century, and is as authentic as its painstaking rebuilding in Washington between 1934 and 1936. The Lindens was eventually named after the many Linden trees that originally surrounded it in Massachusetts. It was, however, first known as “The Great House” when it was built by wealthy merchant and English Loyalist Robert Hooper (right) whom his neighbors called “King Hooper.” It was built in 1754 as his summer house in Danvers, just outside Marblehead, where Hooper maintained a large town house. By the 1930s, the Lindens was threatened with demolition after decades of neglect. In fact, its main floor parlor paneling had already been sold to the Kansas City Museum. After searching for a Colonial era house to move to Washington for years to house their antique furniture collection, the Lindens was bought in early 1934 for $10,000 by George M. and Miriam Hubbard Morris. It was documented with exquisite measured drawings and photographs in January of that year, carefully labeled, disassembled, and placed in six freight train cars for its move to Washington. The Morris’s hired Williamsburg craftsmen and architects to assist in the project, which took 34 months to complete. George Morris was a local attorney who eventually became president of the American Bar Association. While at Dartmouth, he became interested in antiques when he took a course by Homer E. Keyes, founder of Antiques magazine. His wife Miriam, a 1909 graduate of the National Cathedral School, was also keenly interested in antiques following a course of study in Paris (below). The young couple married in 1918, and with Keyes as their advisor, began to collect American Queen Anne and Chippendale furniture and accessories. They eventually purchased a vacant lot in Sheridan-Kalorama on the northwest corner of 24th Street and Kalorama Road where they indented to build a recreation of the Byrd family’s 18th century manor, coined Westover, which was located along the James River. That dream ended with the 1929 stock market crash, according to Morris. Instead, they located and purchased the Lindens five years later. Following a three year rebuilding to exact standards, the Morris’s moved into 2401 Kalorama Road with their three children in 1937. Miriam oversaw what was then considered an expert restoration, concealing lighting fixtures and phones, using electrified candles, and even built the radio into a false bookcase in the library to conceal its location. The exterior paint was combined with sand to replicate a stone finish, a building material in short supply in the 1750s. The parlor walls were recreated from measured drawings from the original at the Kansas City Museum, but the remainder of the interior paneling and grand staircase was complete and had been moved intact from Massachusetts. Miriam’s exhaustive research on every aspect of architectural and antique furnishings for the house led her to eventually become one of most regarded experts on the subject in the United States. She eventually lectured on early Americana in such far away places as Singapore, Thailand, and Japan. She served as the only woman on the State Department’s Fine Arts Committee, established in 1961 to study and acquire early American antiques for the departments Diplomatic reception rooms. Miriam Morris’s collection of antiques wasn’t her only passion in life, however. In 1916, at the age of 25, she drew plans for a bright yellow convertible sports car with crab eye headlights that was made to order by the Biddle Brothers in Philadelphia. She was also an enthusiastic aviatrix, noted as the first woman to fly over Guyana’s Kaieteur Falls in a single-engine plane. She remained at the Lindens with her large and impressive collection of rare early American antiques until her death in June of 1982. The home’s contents were auctioned at Christies in New York the following January. The humble beginnings of the collection, purchased during the Depression brought more than six figures for many of the numerous furniture pieces. According to public records, the Lindens recently sold for $7.165 million in February of 2007 and was featured in Architectural Digest in February of 2014. Is this really the oldest house in Washington, DC? I believe that The Lindens in Kalorama was built in 1754, but the the original cottage of the Rosedale Farmhouse in Cleveland Park was built in the 1730's. The portrait of Robert Hooper which you show in your blog is not Robert "King" Hooper, but his middle son, who was also named Robert. A terrific portrait of "King" Hooper from circa 1767 (also by John Singleton Copley) is in the Pennsylvania Academy of Fine Arts in Philadelphia, PA. A miniature portrait of him was a gift to the exceptionally fine collection of the U.S. State Department (given in 1979 or 1980 in honor a former Sec. of State). There may be no portrait of "King" Hooper's principal wife, Ruth, who was the mother of all 11 of their children (though there's more to that story) But a portrait (also from c.1767) of the woman whom he married in 1764, Hannah White-Cowell, was in the collection of the New York Public Library for many years. Though several of the Hoopers' children were grown (including middle son Robert, whose portrait you show -- in the collection of the Smithsonian Institution's Smithsonian Art Museum), and a few were even married by 1764, several others were fairly young -- and the youngest was just short of 2 years old when the senior Hooper re-married. (The youngest, a boy, had been less than a year old when Hooper's wife died.) His new wife (age 37) had already been twice widowed (not uncommon in the Atlantic seaport), and brought to the her own son and three step-children marriage and Hooper household (since their fathers had died, and the 3 step-children were therefore orphans otherwise). The younger Robert Hooper whose portrait you show eventually married the eldest step-child, and adopted her two younger teenage siblings as his wards, to raise them until they came of age. It's a fascinating family story, in an equally fascinating town (which was the 6th largest in N.America when most of the Copley portraits were painted).